Central stage - floating stage - big stage ... The stage on which the Lent Festival was born. If you want to experience the whole festival atmosphere in one place, you have to visit the floating stage on the Drava river next to the Water tower which is placed between the Old and the Tito bridge. Many associate this stage with rock music. Through the years it became more and more important and recognizable and was soon named after its main sponsor - the Večer newspaper. It is situated on Vojašniški square with a view of an old sundial on one of the facades and the oldest vine in the world. is one of the festival venues that stays alive into the early hours because of the jam sessions that take place after the concerts. It is here that young, promising musicians get the chance to jam with stars that were previously performing on one of the festival stages. The Old Radio stage is located on Vodnikov square near the marketplace. is the oldest stage of the Lent festival and a real trademark that is situated on a typical Lent alley under the Old bridge and the former Big coffee house. A paradise for solo and singer-songwriter performances. The Judgement tower is the most prominent venue of the festival and is dedicated to diverse, yet exquisite and sophisticated music tastes. 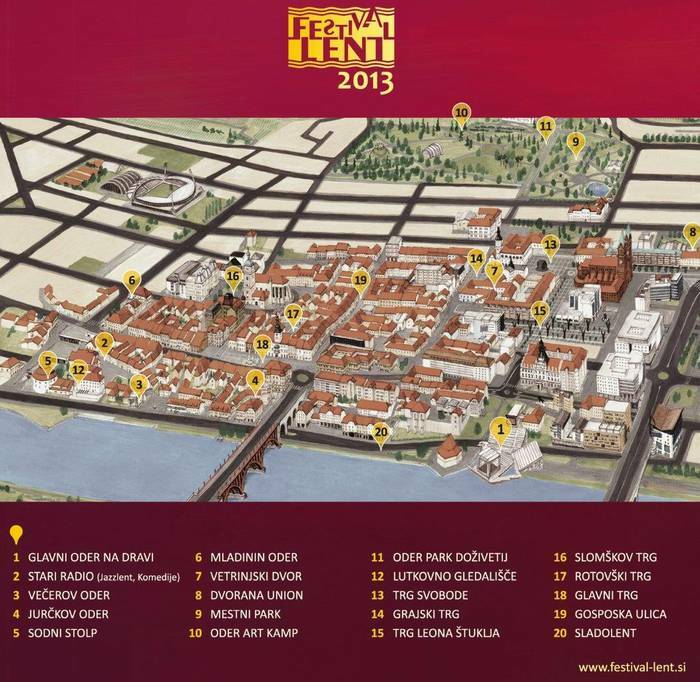 The Stand-up comedy festival during the Lent Festival is the biggest event of its kind in Slovenia. On 16 nights the audience has the chance to see the best comedians from Slovenia and the region of ex-Yugoslavia. The renovated courtyard of the Vetrinjski dvor mansion in the old city centre provides the stage with a special charm. is a programme that offers classical music concerts of musicians from Maribor and guests in the Union hall and the Synagogue. Each year the festival hosts more than 20 chamber music concerts of musicians that have been selected through an open call. The criteria are: interesting, fresh and cogent repertoire, mainly Slovenian composers and a diverse ensemble. For the purposes of the open air Art Camp Festival the Maribor City park turns into an Adventure park. This is an unique European project in the filed of intergenerational cultural education and is the only project that lasts for 16 days, has numerous workshops, mentors, volunteers, performers, international collaborations, a high number of visitors and a pleasant atmosphere. The whole programme is free of charge and makes culture accessible for everyone. The Adventure Park promotes creativity and provides cultural events and the presentation and revival of long forgotten handicrafts. The Lent Festival takes care of everybody - even the sport enthusiasts! On different sports fields in the city (improvised or not) you will be able to choose between many different sports and participate, watch or just cheer.